SKU: Chip 7 Pack-Ranch Categories: Protein Food, Chips Tags: Best Sellers, Ready to Enjoy! Bari Life Ranch Protein Chips are sold in increments of 7 bags. 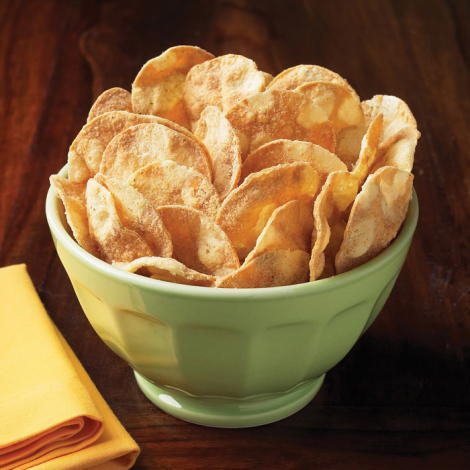 These potato chips have the crunch and yummy ranch flavor you would expect, but without all of the calories, fat and cholesterol so you don’t have to worry about eating too many chips because you can eat the whole bag! Potato (Potato Flakes, Rice Flour, Potato Starch, Salt), Soy (Low-Fat Soy Flour, Rice Flour, Salt), Ranch Seasoning (Buttermilk Powder, Salt, Autolyzed Yeast, Tomato Powder, Vinegar Powder [White Distilled Vinegar, Maltodextrin], Onion Powder, Garlic Powder, Dehydrated Cane Juice, Citric Acid, Natural Flavors, Lactic Acid, Malic Acid, Parsley Flakes, Turmeric, Paprika, Oligofructose Inulin, Supro Isolated Soy Protein), Mild Oleic Sunflower Oil. These protein chips go great with Bari Life Protein Soups. Together they make a wholesome lunch or dinner! Look forward to having these again in later phases of post-surgery life. Great flavor and texture. Very satisfying crunch. Did not miss other chips/snacks with these on hand! These were a great snack! One of the best flavors of the chips offered. I recommend! I really enjoy the taste and texture of these protein chips. These are surprisingly good! When I need something salty tasting and crispy, these are my fave!